Lipid Science Book from C.H.I.P.S. This volume contains the proceedings of the 12th International Conference on Advances in Prostaglandin, Leukotriene and Other Bioactive Lipid Research: Basic Science and Clinical Applications. 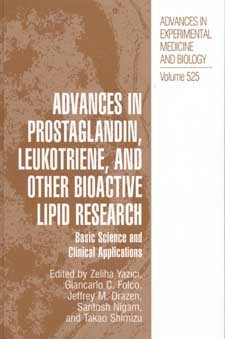 It discusses advances in bioactive lipid research with special attention to cancer, cardiovascular diseases, gastrointestinal diseases and respiratory diseases as well as specific topics like the role of leukotrienes and lipoxins in inflammation, the cytochrome P450 pathway, the genetics and genomics of bioactive lipids, lipid peroxidation, apoptosis, angiogenesis, isoprostanes, receptors and inhibitors, cyclooxygenase and lipoxygenase pathways and inhibitors, prostaglandin synthases and receptor signaling, phospholipases and inhibitors.